Ashford Dog Training Club opened in September 2005 and is owned and run by Sandra Tomsett. Our primary aim is to promote responsible dog ownership and happy, well-behaved pet dogs by helping owners understand and train their dogs. Our training methods are reward based, fair and effective. Regular classes are held on Monday evenings at The SWAN Centre, South Willesborough, Ashford, and Thursday evenings at Victory Hall, Hamstreet. You are welcome to come along and watch a class in progress. 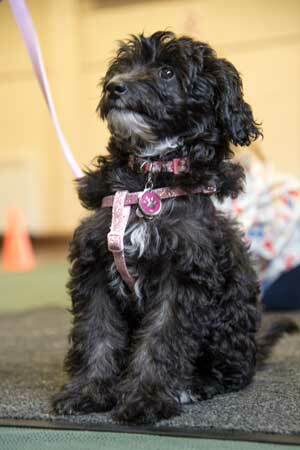 We hold small group classes for puppies and dogs that are happy to work in the presence of other dogs. For dogs and/or owners that find a group situation too stressful we can offer one-to-one training, tailored to your specific needs. Hamstreet is located some seven miles south of Ashford, Kent, just on the boundary of Romney Marsh. Victory Hall is in the centre of the village facing the village green. The hall is light and airy with good parking facilities and access for the disabled. The outside green adds another area we can utilise for training in good weather. The South Willesborough and Newtown Community Centre is a modern building with good car parking. It is located a mile south-east of Ashford with easy access from the A2042 Romney Marsh Road via Newtown Road. "I became interested in dog training and behaviour after getting my first dog some 35 years ago and going along to a local training club. Since then I have studied dog training and behaviour and continue to do so. I helped run classes at another training club for several years before eventually setting up Ashford Dog Training Club myself. I never stop learning and attend courses and seminars whenever possible, but my best teachers have got to be my own dogs and the many dogs and owners I have met and helped over the years."